What is re spect? In my own words respect means to treat others in a well behave and mannered way not only adults but even people younger than you. 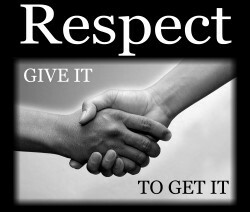 people earn respect when they show respect, respect is earned by how people see you. If your acting immature and foolish people will probably will not be respect to you because of what they see and hear from you. And im sure everybody would want to be respected because you feel good and appreciated for being respectful. From my personal experience i have learned that people want to be respected because one time i direspected somebody i know and they turned around on me and did the same thing, which was direspect me in the same way i did. that shows that respect is earned. “I’m not concerned with your liking or disliking me… All I ask is that you respect me as a human being”.